The word "igneous" means having solidified from hot magma or lava. Igneous rocks are products of the molten products below the Earth's crust. Following you will find some examples of igneous rocks. Pumice is a light colored and lightweight igneous rock ejected from a volcano at very high heat and pressure. Gases escape as the rock hardens, leaving bubbles and holes throughout the rock, and resulting in its light weight. Crushed pumice is often added to soaps to clean and exfoliate. Andesite, named after the Andes Mountains, is an extrusive igneous rock made from a variety of minerals. One of its main components, plagioclase, a mineral that is found in the rocks of the Earth's moon. The most common igneous rock found at the earth's surface is granite. Widely used in construction, granite contains crystals that are visible to the naked eye due to the very slow crystallization below the surface. Granite occurs in a range of vibrant colors. Basalt, a dark and fine-grained igneous rock, is found abundantly beneath the surface of the earth, making it the commonest bedrock. Like andesite, basalt is found on the surface of the moon as well as on the Earth. One example of extrusive igneous rock - igneous rock that cools above the surface of the ground rather than beneath - is obsidian. Obsidian is smooth like glass and usually jet black, although it can be seen in a variety of colors. While it is rather fragile, obsidian breaks with a conchoidal fracture and has very sharp edges. It was widely used by ancient cultures in knives and arrowheads, and is used today in surgical instruments since its edges are sharper and thinner than surgical steel. Pegmatite is a crystalline igneous rock that forms below the Earth's surface. One of the things that makes it visually striking is its large crystals, similar to granite. It forms during the latter phases of magma chamber crystallization and sometimes contains rare minerals. Most rocks are tough, but only one is tuff, an igneous rock that forms from materials ejected from a volcano that solidify. It is made largely from ash and cinder. Some call tuff by the name "tufa," especially the tuff that is used as a building material. Dacite is a rock that is formed from large volcanic eruptions. It has a high silica content and a high crystal content, which make it prone to a violent eruption. In fact, dacite domes from earlier eruptions exploded in the catastrophic eruption of Mount Saint Helens in Washington State in 1980. 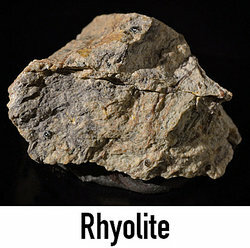 Rhyolite is another silica-heavy example of igneous rock, prone to explosion in eruptions. Its composition also contains large portions of quartz and feldspar. Eruptions of rhyolite often create the igneous rocks obsidian and pumice. Peridotite, a very coarse-grained igneous rock, is formed below the Earth. Its composition contains high levels of olivine, which is rich in magnesium, as well as iron. Peridotite is of special interest to scientists because the rock provides important clues about the formation of the earth's mantle. So, now you have lots of examples of igneous rocks and you can better understand just what igneous means and where examples of it can be found. "Igneous Examples." YourDictionary, n.d. Web. 18 April 2019. <https://examples.yourdictionary.com/igneous-examples.html>. The word "igneous" means having solidified from hot magma or lava. Igneous rocks are products of the molten products below the Earth’s crust.